Composting turns food and organic materials waste into rich soil and reduces waste in the landfill. Reduce overall household trash and divert hundreds of pounds of landfill waste each year. Compost is collected and delivered to the SCRAPS program. 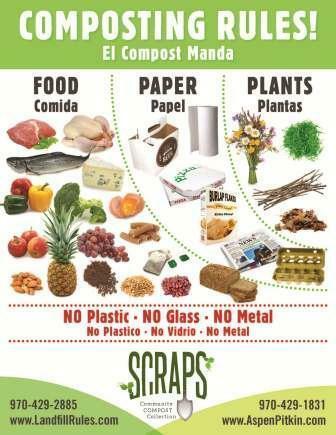 The SCRAPS program is a joint effort by the Pitkin County Solid Waste Center (landfill) and the City’s Department of Environmental Health and Sustainability to assist businesses and residents in diverting organic waste from the landfill. Bag it – collect compost materials in small bags (paper or compostable) every couple of days, then close the bag and place inside bucket. This will help reduce the smell and slow the rate the food products break down. Freeze it – place meat, cheese, fish or other ‘stinky’ items in a compostable or paper bag and put into the freezer. Then, put the frozen material into the collection bucket on the day it will be picked up. Layer it – place layers of paper products in between layers of food products to slow down the decomposition and trap odors. Clean it– giving your compost collection bucket a rinse each week and a wash when it needs it will help to keep it smell-free and unattractive to bears. Spraying cleaning solution or diluted bleach on the lid will also help keep it unattractive. Go vegan – keeping meat and dairy out of the compost collection bucket will reduce the attraction to bears by reducing the odors. However, be sure you are disposing of these items safely in the regular trash. Bagging them and freezing them are still a good idea when you choose to place meat and cheese into the trash instead of the compost during bear season. * NOTICE- Those who have a secure trash enclosure, a bear-proof bin secured with metal can place compost material within the bin prior to day of pick-up. Those with plastic bins need to keep those bins inside until day of pick-up. Bins made entirely of plastic have been breached by bears, despite the ‘bear-proof’ certification. Compost collection is on Tuesdays and Fridays every week and is available in Carbondale, Aspen, and all locations in between including El Jebel, Basalt, Snowmass, and Wood Creek. Sign Up for Compost Collection Today! Are you already a Mountain Waste & Recycling customer who would like to add composting services or are you a new customer looking for a dependable local waste management company in the area? Contact Mountain Waste & Recycling today or give us a call at (970) 963.3435 to get more information and get started!